From cooking rice to making yogurt, Mueller 10-in-1 Pro Series 6Q Pressure Cooker can do just about anything. 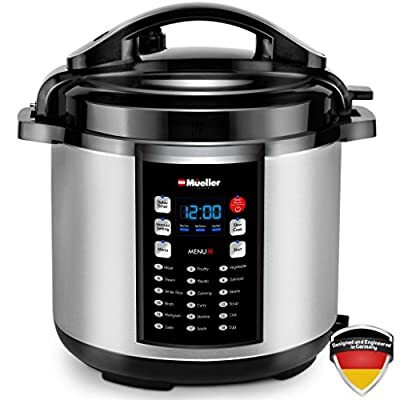 Designed in Germany, this cooker has premium quality rubber seals, internal microprocessors that enable it to last longer and best reliable handles for heat resistance. 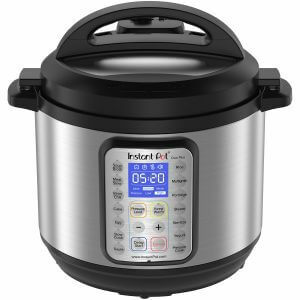 This electric pressure cooker has 18 different programs including white rice, soup, steam, sauté, beans, curry, sterilize, slow cook, keep warm mode, canning, curry, and many more. These different modes enable you to cook your favorite recipes. This electric cooker’s interior comes with a nonstick ceramic coating which ensures uniform distribution of heat and also helps preserve flavor, nutrients, and aroma of the food you are cooking. It features the latest technology. This smart pressure cooker also has microprocessors that monitor and keep track of the pressure, temperature, and time thus giving you consistent results every time. Mueller 10-in-1 Pro Series 6Q Pressure Cooker is certified by ULC and UL. Unlike most traditional pressure cookers, this cooker features a 24-hour timer which enables you to delay the start time for your cooking. So, if you want to come home and get your dinner ready, you can always prepare and add all the ingredients in this cooker and set the time you want it to start cooking. You will come and get your supper ready and warm. This is a very useful feature as you don’t have to worry about your cooked food getting cold. This electric cooker will automatically switch to this mode once your food has cooked. This means your food will remain at warm temperature until serving time. It is designed to hold aroma and nutrients of your food thereby making them delicious and healthier. This electric cooker features microprocessors that are embedded in it to help maintain, monitor, and fine-tune the temperature and pressure inside the cooker. It does not contain any harmful chemicals thanks to its non-stick coating. If you are feeling intimidated by the different cooking programs, you can refer to its instructional manual, and you will understand what each program is meant to do. In case you are new to pressure cooking concept, this manual will enlighten you. Besides, the cookbook provided will introduce you to nutritious and healthy pressure cooking recipes you can try. Mueller 10-in-1 Pro Series 6Q Pressure Cooker is made with high-quality materials and designed to last. The rubber seals are heat-resistant and strong, and its internal pot will stand the test of time. 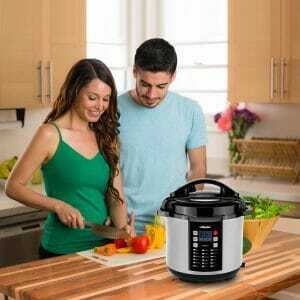 You will enjoy cooking with this pressure cooker as it features 18 programs that will enable you to cook various foods. This cooker can cook virtually anything; just select the food you want to make, and this electric cooker will do the rest of the work as you wait to serve your healthy and delicious meals. With a stainless steel rack, you can cook two separate meals simultaneously. Its fully-sealed body ensures all the aroma, nutrients, and flavor of your food is retained for best tasting meals all the time. Mueller 10-in-1 Pro Series 6Q Pressure Cooker is undoubtedly one of the best electric pressure cookers on the market. Where can I buy a steamer basket and other accessories. I got mine on Amazon and it has handles for lifting.